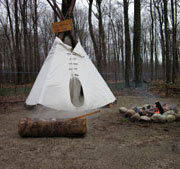 The Sugar Bush is located at 1222 Apple Grove Rd, Woolwich, ON. We ask the groups to meet us at the Sugar Bush with the bus. We do have a parking area for any parents that would like to drive separately. Tours available for all students; we ask that you contact us for information on pricing and scheduling. 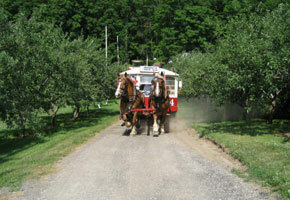 St Jacobs horse Drawn Tours is happy to welcome school groups on the Mennonite Farm Tour and Maple Sugar Bush Tours. Everyone is sure to learn something new because these tours are so informative and educational. 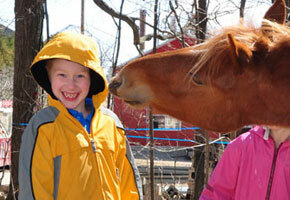 We feel privileged to have hosted preschool to university groups in the past. Our knowledgeable guides will adapt the tour to make it appealing to any age group. We encourage teachers to introduce the information that is covered in the tours before attending. Since we would like to make these tours available for all students we ask that you contact us for information on pricing and scheduling. 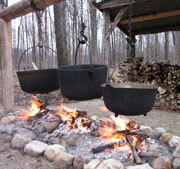 Our most popular educational tour is The Sugar Bush Tour. Our goal is to provide a fun and interactive learning experience that everyone is sure to remember. 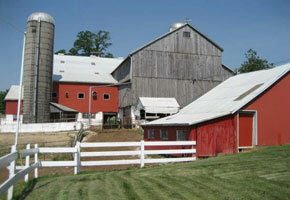 We have partnered with Matthew Martin, who is the 4th generation maple syrup producer, on his home farm. Matthew's 1700 tree operation is cutting edge in today's maple syrup industry. We have built full scale working displays that give the viewer an accurate picture of how maple syrup was and is produced. 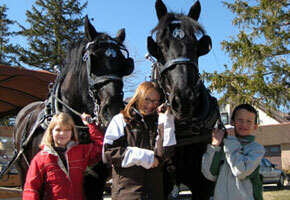 Whether speaking to the public or to school groups, St Jacobs Horse Drawn Tours' goal is to accurately educate the listener. These tours take place from the first weekend in March until April 15th. We have availability every day during the week in both the mornings and afternoons. The sugar bush is located in the St Jacobs area at 1222 Apple Grove Rd, Woolwich Ontario (1 km from the St Jacobs Farmers Market). This tour starts at the tree introducing sap and the methods of collection. We then tour the Native American Sugar Camp, The Settler's Sugar Camp, The Century Sugar Camp, and the modern day operation that is used today. At each location the guide points out and explains the collection and production process used during each time period. Along the way, we are inviting any questions that might arise. Since there is a lot of information, the guides try to adapt their commentary for every age group. 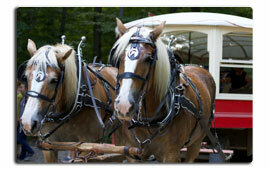 While on the wagon ride the students are introduced to and learn about our large draft horses. As they travel through the sugar bush and farm they get an idea of how big the wood lot is and the amount of pipe line that is used to collect the sap. The guide/driver will also talk about the various wild animals that live in the sugar bush and the affect they have on collecting the sap. We encourage the students to feel free to ask any questions that they might have along the way. 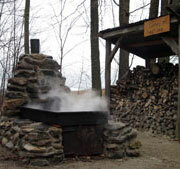 A visit to the sugar bush would not be complete without tasting some of the maple syrup produced on location. We do this by giving the students a maple toffee on snow demonstration and allowing them to sample it at the end. Maple toffee on snow is pure maple syrup boiled, poured onto snow, and eaten off of a popsicle stick. 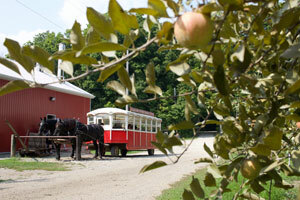 We also offer hot and cold apple cider and bottled water along with the tour. If the teachers and staff would like to bring an additional snack, they are more than welcome to do so. 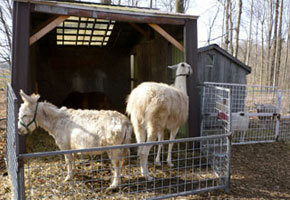 In the sugar bush we have a petting zoo complete with a variety of farm animals. 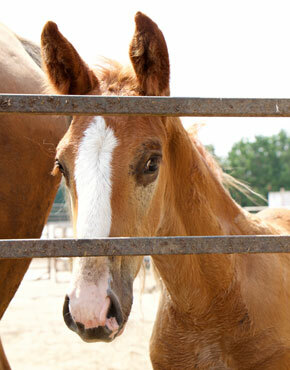 The children are free to pet them and feed a few of them for the remainder of their time at this station. The groups will spend between 20 and 30 minutes at each station and then rotate. 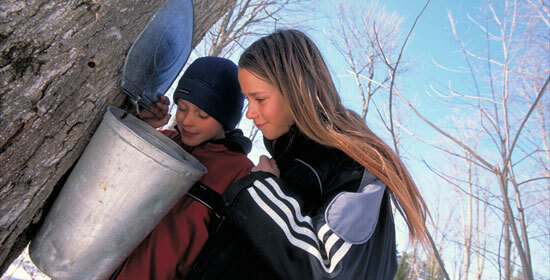 The average time spent at the Sugar Bush for a school group is about one and a half hours to two hours. The cost per student is $10.50, which includes HST. If your group is smaller than 15 students there is an additional charge. We invite teachers, support staff, and parents to join us free of charge since they are a huge asset to making a trip like this flow smoothly. 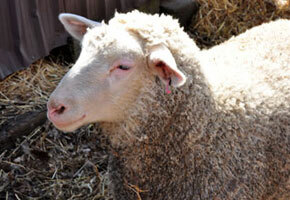 We also have a small retail shop on location to give you the opportunity to purchase the products from the farm. Thanks for your consideration and we look forward to seeing you at the Sugar Bush!